Genea-Musings: Exploring the New FamilySearch Collection "Pennsylvania Civil Marriages, 1677-1950"
I noted that FamilySearch added a new record collection yesterday - the "Pennsylvania Civil Marriages, 1677-1950." There appear to be records from seven Pennsylvania counties - Allegheny, Bucks, Lancaster, Lehigh, Luzerne, Montgomery and Philadelphia. The collection is searchable. I searched for the surname "Seaver" and there were 41 matches, all from Philadelphia County. Almost every match had more than one listing on the results page. 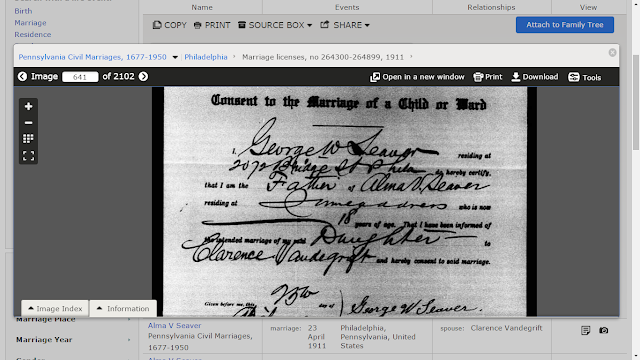 The image above is a license granted on 23 April 1911 to marry Clarence Vandegrift and Alma V. Seaver. Note that the place and date of birth, occupation, address, and a statement about number of marriages and occupation are provided for both parties. The next image (640 of 2102) is of a blank cover (not shown). The fifth image (642 of 2102) is the return of marriage dated 26th April 1911. That was the end of the images for this specific marriage record. This is why there are several entries on the results list - there is more than one image for this record. 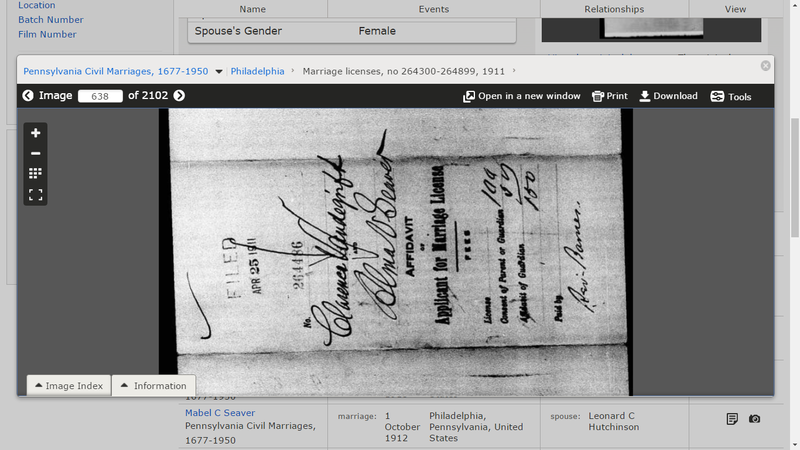 "Pennsylvania Civil Marriages, 1677-1950," database with images, FamilySearch (https://familysearch.org/ark:/61903/3:1:S3HT-DC59-S9W?cc=2466357&wc=QDNG-MJB%3A1588753668%2C1588753974 : 24 January 2017), Philadelphia > image 642 of 2102; citing the Register of Wills Offices from various counties. 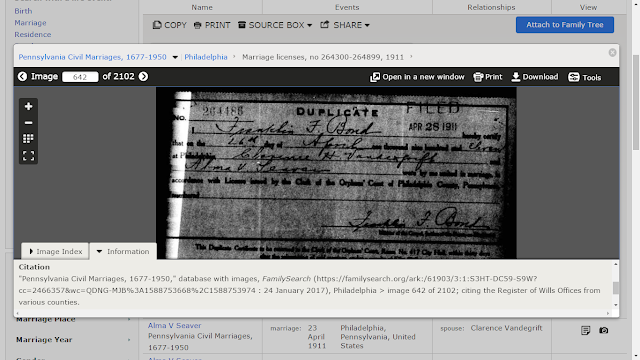 "Pennsylvania Civil Marriages, 1677-1950," indexed database with digital image, FamilySearch (https://familysearch.org), Philadelphia > Marriage licenses, no. 264300 - 264899, 1911, image 642 of 2102, Clarence Vandegrift and Alma V. Seaver entry; citing the Register of Wills Offices from various counties. 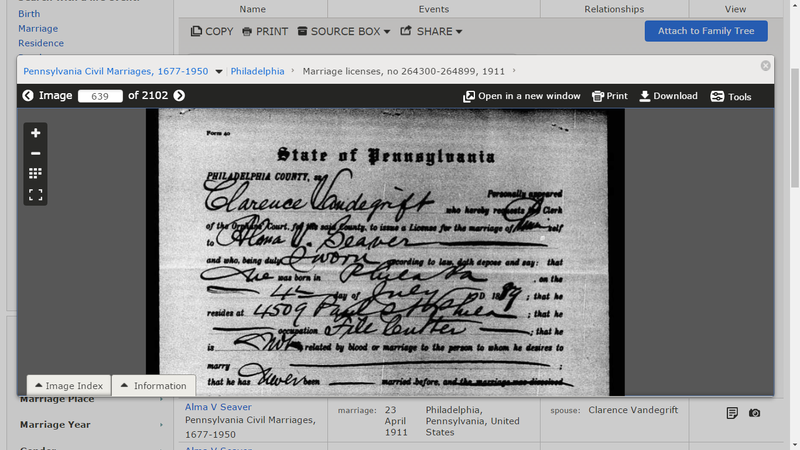 I will "mine" this database for all of my one-name study surnames (Seaver, Carringer, Auble, Vaux) tonight. I was so excited when I saw your post. But, alas, not the counties I need. Darn! But, thanks for sharing Randy. Thank you. My wife pointed this out to me. So after reading it I followed up with my great grandfather's name. I found the same documents as you mention. So now I have a definitive date for their marriage but also my maternal gg grandmother's name, and the birth dates of my g grandparents. Durn! My parents were married in 1941 in Philadelphia County but neither last name came up in a search.